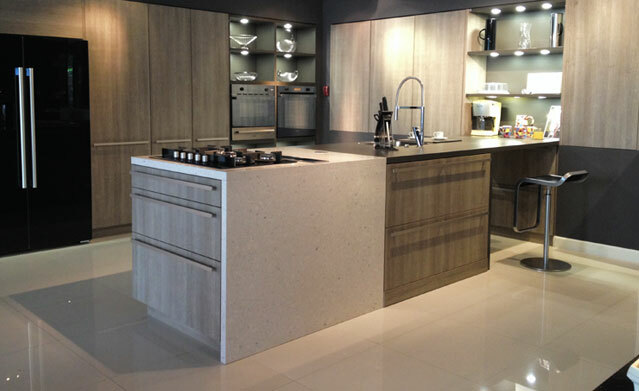 On November 2014, Kitchen Tech opened its brand new showroom on Soi Ruamrudee. Khun Connie Charuvastr, with over 20 years of experience and expertise in the specialisation in kitchens has decided to rekindle her passion in luxury kitchen. 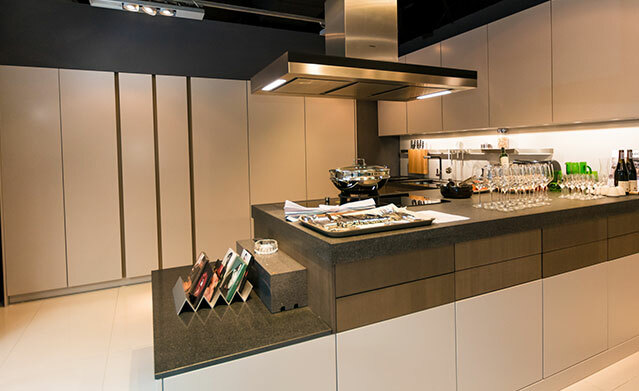 With this new showroom and added facilities, Kitchen Tech strives to continue to serve its loyal customers with the highest standard of quality service and opens its door to new customers. A functional vision for the backsplash. 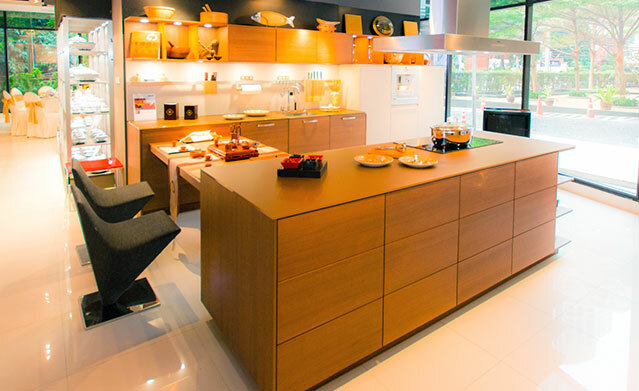 The house of LEICHT has designed the MODO system, focusing on the exciting contrast of metal and natural wood. It will enhance every modern kitchen with it’s clear lines and puristic form language. It provides easy access to the required cooking utensils and eases the straight lined kitchen architecture at the same time. Materials and colours accentuate the room architecture. The particularly natural-looking stone oak décor with visible cracks and tangible grain brings to life tall unit run. The ultimate dream of a storage centre. The total cupboard depth is accessible on three levels with door and swing-out shelves. Everything is freely accessible. 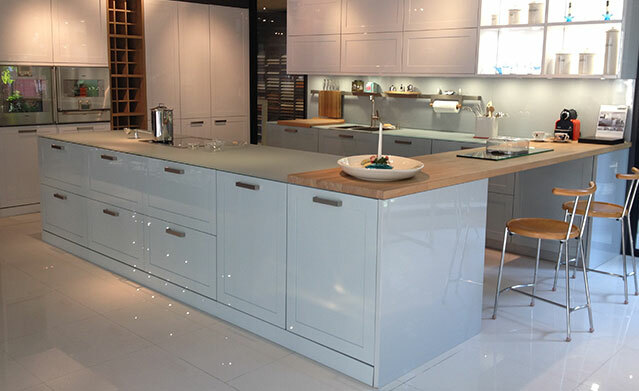 A modern kitchen design with classic, high gloss lacquered cabinet fronts in two colors; arctic white for the tall units, and light blue-grey for the island and matte glass countertop, The oak wine rack provides a natural contrast to compliment the combination of surfaces. A real-wood worktop between the kitchen and living area makes space for extra guests. 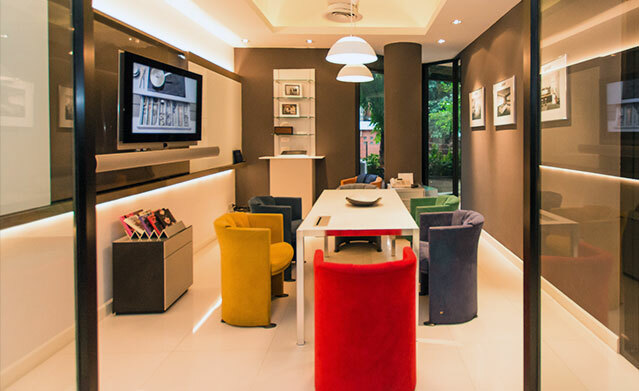 The fixtures inside the units are designed to suit the residents’ needs. Swing-out shelves in the 90 cm wide Preparation Centre reveal the total storage space and bring stored goods from the depth of the cupboard within comfortable reach. The integral solidity and strength of LEICHT quartz surfaces provide designers with the widest possible choice of profile options availability in natural stone products. This freedom inspires architects and designers to explore creative concepts and shape them into practical applications. The island block, the transition to the living area, is the perfect contrast in its two colours. A rich inner life unfolds on opening doors and pullouts. An idea solution with the 30 cm wide pullout providing an instant view and access from both sides. When you choose Kitchen Tech, you choose a professional and highly competent business partner with over 20 years of experience in the kitchen business. No matter the scale of the project; residential, restaurant, commercials projects or hotel, we are ready and capable of helping you with the professional consultation, detail planning, expert installation and impressive after-sale service.